The Ristocamping Gran Sasso is a small camping (13 pitches campers / caravans and 40 tent pitches), lovely and intimate, which is located in a path away from Santo Stefano di Sessanio (AQ), about 1200m above sea level. The Ristocamping ago of kindness from the staff his strong point, and the cozy and intimate environment of the camp make it a real gem. Essendo un piccolo campeggio, le piazzole non sono molto ampie e chiaramente delimitate, e gli attacchi luce non sono moltissimi, ma visto il mood rustico e “casalingo” dell’insieme, queste piccole pecche non creano eccessivi fastidi. The maintenance is carried out daily in the camp: a broken shower in the evening it was repaired by the next morning. 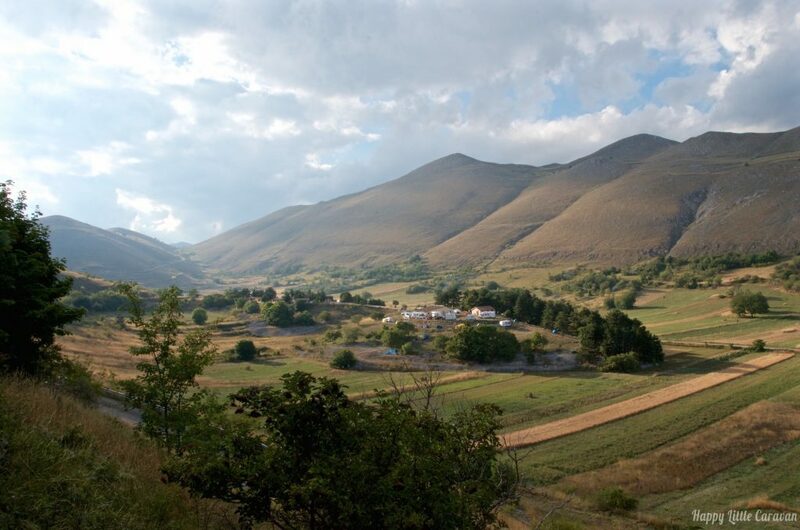 The camp is located inside the national park of Gran Sasso, in a fantastic location on top of a hill just a few meters from the beautiful village of Santo Stefano di Sessanio reached within a few minutes. The camp does not have a market. The camp does not have a pool. The campsite restaurant was a fantastic surprise: offers delicious dishes as the first of pesto sun-dried tomatoes, saffron and cheese must try, the cost is absolutely affordable and is around 20 euro. Do not miss the ricotta and pear parfait!! Fortunately there is no trace of animation in the camp: to enliven the stay, however, we think the big dog Hector, who will accompany you during the walking tours showing you the right way to St. Stephen, and the cat Picchiatella that if you will be quite hospitable, cheer your stay with purring and cuddling. Bathrooms are located in a single complex, and are cleaned only once (in the morning), but in general, not having too many guests, they are always in excellent condition. Hot water is only present in the showers and in the sinks. And ‘only one shower for men and one for women shower, the hot water is supplied by a water heater so it can happen that will end in the middle of the shower, if the customers earlier were disrespectful. No toilet paper, towels or soap. Wash basins, showers and sinks are acceptably clean. Within a natural valley at 1200 meters above sea level in the heart of the Gran Sasso, you are already starting point for many walks and beautiful walks without having to take cars or public transport (which is hard to find). The Ristocamping, although positioned on a hill, does not present any problem of viability: the few pitches for caravans and motor homes are all on the flat, around the central structure. Once you leave the highway A24 at the Eagle, had to continue to Barisciano (20km), then take the last 10km of trail on the uphill road, but easily passable by most vehicles because with good slope, towards Santo Stefano di Sessanio. The camp staff is extremely competent, member of the CAI and will give you all the information you need to take walks or more challenging routes. It ‘a free wireless network and good speed near the restaurant. The staff is always friendly and helpful, and very nice. The price is extremely low: 8 nights in a caravan for two people with electricity and car parking have cost 168 euro. It’s possible to book trips to the mountains accompanied by an experienced mountain guide, but there are no “frivolous” as football fields, table tennis etc. There are barbecue grills available and a small play area for children (in addition to the guidance of Ettore dog for walks in the country). The extra point is absolutely deserved, beautiful area, rustic camping, cute and cheap.